Microsoft has announced a Kinect for PC – with a much shorter focal range solving the biggest problem with implementing the motion and voice sensor for the desktop. Although Microsoft has been working hard convincing developers to turn the Kinect more than a games peripheral, the current version is not useful for close objects. Microsoft has now announced that it is launching a Kinect for PC in early 2012. "Since announcing a few weeks ago that the Kinect for Windows commercial program will launch in early 2012, we've been asked whether there will also be new Kinect hardware especially for Windows," blogged general manager Craig Eisner. "The answer is yes; building on the existing Kinect for Xbox 360 device, we have optimized certain hardware components and made firmware adjustments which better enable PC-centric scenarios. "Coupled with the numerous upgrades and improvements our team is making to the Software Development Kit (SDK) and runtime, the new hardware delivers features and functionality that Windows developers and Microsoft customers have been asking for. "Simple changes include shortening the USB cable to ensure reliability across a broad range of computers and the inclusion of a small dongle to improve coexistence with other USB peripherals. "Of particular interest to developers will be the new firmware which enables the depth camera to see objects as close as 50 centimetres in front of the device without losing accuracy or precision, with graceful degradation down to 40 centimetres. 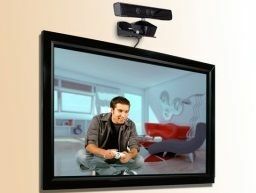 "Near Mode" will enable a whole new class of "close up" applications, beyond the living room scenarios for Kinect for Xbox 360. "This is one of the most requested features from the many developers and companies participating in our Kinect for Windows pilot program and folks commenting on our forums, and we're pleased to deliver this, and more, at launch." This is a significant moment for Kinect – which has proven to massively popular as a peripheral for the Xbox and still has bags of untapped potential. Microsoft has always been aware that Kinect has desktop applications, and the arrival of "near mode" could really fire up a whole raft of cool applications.